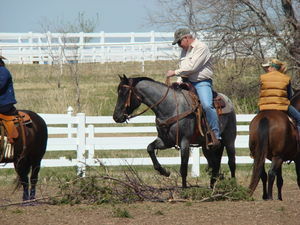 The Foundation Quarter Horse is easily recognized by his body shape and unique conformation. He is more horse for the height than is found in any other breed. Built low to the ground, much of the time he does not exceed fifteen hands, but due to his build will often weigh twelve hundred pounds or more. The pattern of his muscle adorns nearly every part of his body. There is his small alert ear, wide set honest bright eye that windows his great intelligence and kindness, bulging jaw, neck of moderate length joined low into his sloping shoulder, topped by a well defined wither. A short back with strong lion, deep barrel with long underline, well sprung ribs with great heart girth. The space between the forelegs is ample to supply for a wide, well developed chest, while the forearms, gaskins, and hindquarters carry the muscle that separates the Foundation Quarter Horse from all others. Seen from the rear the power filled stifles are wider than the croup. 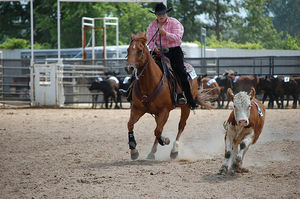 The bones of the Foundation Quarter Horse are trim, dense, and sturdy. His rugged frame is necessary to support the bulk that provides his strength. The cannon bones are short and flat set above strong pasterns. The foot is deep with open heel, well rounded with sufficient size. When under observation, the animal displays his divine design.